I have been monitoring and reporting on the number of distressed homes for sale for more than seven years. Prior to 2007, foreclosures, short sales, and bank owned properties were such an insignificant percentage of the Tallahassee real estate market that there was really no need to consider them as anything more than "noise" in our data. But times change, so we are constantly monitoring the inventory of homes for sale that are being sold under less than ideal situations. If you are a new arrival to the Tallahassee Real Estate Blog, then "welcome!" But if you are a long-term reader of our blog and housing reports, then you will be seeing something that we talk about regularly, but displayed in a different light. 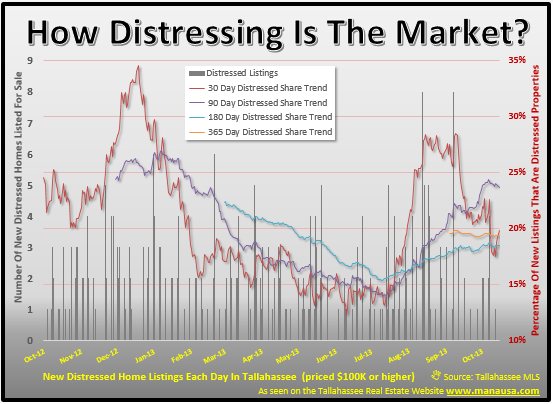 The following real estate graph is titled "distressing" rather than "distressed" because it focuses on the changes that are occurring in the market. Specifically, it measures the long and short term trends of distressed homes for sale as a percentage of the overall market. From the graph above, we track the average percentage of homes that are being listed as "distressed" versus all homes listed in the Tallahassee MLS. The longest trend is the 365 day trend line (orange) which shows that over the past year, roughly 19% of the homes listed for sale in Tallahassee were marketed as distressed. The shortest trend (red line) shows that over the past 30 days, roughly 20% of the homes that came on the market were distressed. If we start seeing the shorter trends move consistently different than the longer trends, then we can expect the long-term trend to start moving in that direction. Unfortunately, the data that we need for this graph is only about 14 months old, so it will take some time to identify the seasonal impact of homes entering the market versus the situational nature of the short sales and foreclosures that are being listed. The following map shows current listings in the Tallahassee MLS that are marked as short sales, foreclosures, and bank owned properties. If you want to see more about a specific listing, simply click on its location marker and the listing page will appear. I hope you found our latest view of distressed homes for sale informative, if you would like to know more you can always drop us a note anytime, we respond lighting fast! Thanks, Joe. Great information. We do seem to be improving, but at best it's a shaky recovery. At least the trend is moving or changing somehow in a positive way. The housing market is slowly gaining its former prestige. Pretty soon, more and more people will invest again for houses since the economy is also growing.